Our Technology – Innovative NeuroTechnologies, Inc.
Tau is a highly soluble protein that normally stabilizes microtubules, commonly referred to as Microtubule-Associated Proteins (MAPs), primarily in neurons of the central nervous system (CNS) and to a much lesser extent expressed in astrocytes and oligodentrocytes. 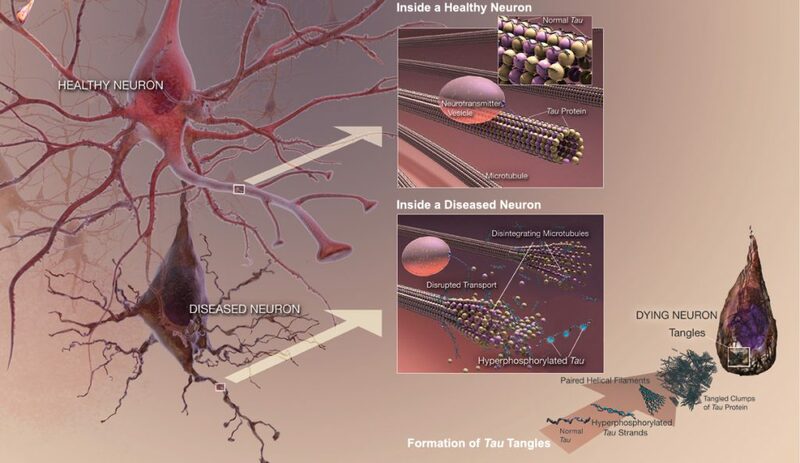 Hyperphosphorylation of the Tau protein (i.e., Tau inclusions or pTau) can result in the self-assembly of tangles of paired helical filaments (PHFs) and straight filaments, which are involved in the pathogenesis of Alzheimer’s disease (AD) and other related tauopathies. In AD brain tissue, all of the six isoforms of Tau are present in an often hyperphosphorylated state in PHFs. When Tau becomes misfolded, this otherwise very soluble protein can form extremely insoluble aggregates that contribute to a number of neurodegenerative tauopathies like AD. In addition, due to the observation of how Tau may be released extracellularly by an exosome-based mechanism and potentially spread in AD, it suggests that Tau has some similarities to prion proteins. Unlike beta-amyloid (Aβ), Tau is a much larger protein with multiple epitopes that can possibly be hyperphosphorylated, and thereby multiple sites for prospective therapeutic intervention. INT has identified three separate monoclonal antibodies (mAbs) against three key and separate epitopes of the Tau protein that can potentially serve as passive immunotherapeutic strategies to reduce the cognitive decline (i.e., dementia or memory impairment) and pathological deficits observed not only in AD, but other neurodegenerative tauopathies listed below. FTLD or FTD: the name for a group of clinically, neuropathologically, and genetically heterogeneous disorders associated with atrophy in the frontal lobe and temporal lobe of the brain, with sparing of the parietal and occipital lobes. The term FTD as a “general term” can also refer to Pick’s disease.FTD is a progressive, degenerative brain disease and in people under age 60, it is the most common cause of dementia and affects as many people as Alzheimer’s disease (AD) in the 45-64 age group. Approximately 40% of patients with FTD have a family history of a similar dementia, while 60% of people with FTD develop it without any known cause. Moreover, three different clinical presentations have been described for FTD, namely, behavioral variant Frontotemporal Dementia (bvFTD), Semantic Dementia (SD), and Progressive Non-Fluent Aphasia (PNFA).Tau pathology is closely associated with FTD as well as TAR DNA-binding protein 43 (TDP-43) pathology, which has been previously described as dementia with ubiquitin positive, tau- and alpha-synuclein negative inclusions with and without motor neuron degeneration. There is presently no known cure for FTD, but treatments are available to manage the behavioral symptoms. CTE is a form of encephalopathy that is recognized as a progressive degenerative disease, which can only be definitively diagnosed post mortem in individuals with a history of multiple concussions and other forms of head injury. The disease was previously referred to as dementia pugilistica (DP) since it was initially observed in individuals with a history of boxing. CTE has most commonly been found in professional athletes participating in American football, ice hockey, professional wrestling, and other related contact sports in which the individual has experienced repetitive brain trauma. In addition, it has been observed in soldiers exposed to a blast or a concussive injury, in both cases resulting in characteristic degeneration of brain tissue and the accumulation of tau protein. Individuals with CTE may show symptoms of dementia, such as memory loss, aggression, confusion, and depression, which generally appear years or many decades after the trauma.It is important to note that repeated concussions and injuries less serious than concussions (i.e., sub-concussions) suffered while engaging in contact sports over a long period of time can result in CTE. On the other hand, in the case of blast injury, a single exposure to a blast and the subsequent violent movement of the head in the blast wind can cause the condition. PSP is a degenerative disease involving the gradual deterioration and death of specific volumes of the brain, such as the basal ganglia, brainstem, frontal lobes, dentate nucleus of the cerebellum, and the spinal cord. It is recognized as a tauopathy, but the observed clumps of tau protein (i.e., neurofibrillary tangles) are often different from those seen in AD. In addition, males and females are affected approximately equally in this condition and there is no racial, geographical, or occupational predilection. Approximately 6 people per 100,000 population have PSP.The initial symptoms in two-thirds of cases of PSP are loss of balance, lunging forward when mobilizing, fast walking, bumping into objects or people, falls, and changes in personality and general slowing of movement. Later symptoms include dementia (i.e., typically involving loss of inhibition and ability to organize information), slurring of speech, difficulty swallowing, and difficulty moving the eyes (particularly in the vertical direction).Since there are currently no cure for PSP, treatment focuses primarily on managing and improving the related signs and symptoms. CBD is a rare, progressive neurodegenerative disease involving the cerebral cortex (i.e., frontal lobes) and basal ganglia. CBD is characterized by marked disorders in movement and cognitive dysfunction, and is classified as one of the Parkinson plus syndromes.CBD progresses gradually. Initial symptoms, which typically begin at or around age 60, may first appear on one side of the body (unilateral), but eventually affect both sides as the disease progresses. As in Parkinson’s disease (PD), symptoms of CBD include, poor coordination, akinesia (an absence of movements), rigidity (a resistance to imposed movement), disequilibrium (impaired balance), and limb dystonia (abnormal muscle postures). Other symptoms, such as cognitive and visual-spatial impairments, apraxia (loss of the ability to make familiar, purposeful movements), hesitant and halting speech, myoclonus (muscular jerks), and dysphagia (difficulty swallowing) may also occur. An individual with CBD eventually becomes unable to walk.There is presently no treatment available to slow the course of CBD, and the symptoms of the disease are generally resistant to therapy. Drugs used to treat Parkinson disease-type symptoms do not produce any significant or sustained improvement. Occupational, physical, and speech therapy can help in managing disability. FTDP-17 is a autosomal dominant neurodegenerative disorder, which has three main features, including behavioral and personality changes, cognitive impairment, and motor symptoms. FTDP-17 is an extremely rare condition and is caused by mutations in the tau gene. Over 100 families with 38 different mutations in the tau gene have been identified worldwide.Definitive diagnosis of FTDP-17 requires a combination of characteristic clinical and pathological features, including molecular genetic analysis. Currently, treatment for FTDP-17 is only symptomatic and supportive. In addition, the prognosis and rate of the disease’s progression vary considerably among individual patients and family members, ranging from life expectancies of several months to several years, and in certain exceptional cases, as long as two decades.